Richard J Evans new biography of the Communist Party historian Eric Hobsbawm is a significant publishing event. It is hard to believe that Eric Hobsbawm: A Life in History is the first orthodox biography of such a distinguished historian and leading member of a group of Communist Party historians who have been a dominant historical force for past fifty or so years. Hobsbawm once wrote that he came to history through Marxism rather than the other way around. In Interesting Times Hobsbawm credits the Communist Party for providing him with camaraderie and fellowship. The CP further polished his early acceptance of Stalinism, and to paraphrase Gerry Healy, Hobsbawm kept one “soiled old suitcase labelled anti-Trotskyism”. His membership of the Party as cited in Evan’s book did not always help his academic career. Quite extraordinary in the book and public recently Evans plays down the extent Hobsbawm’s life was damaged by his membership of the CP. It is worth reading both Evans book and Hobsbawm’s Interesting Times together. Reading both it is clear that despite his Stalinism Hobsbawm is an impressive writer. Sharp and unbridgeable political differences aside his autobiography does have a striking similarity to Leon Trotsky’s My Life. One writer went so far as to say that “ Hobsbawm’s significance goes beyond the structure of his books. In his writings on European history, he covered the whole range of the continent’s civilisation, from politics to the economy, and social and cultural life. He also placed Europe within a broader global context. The absence of chronology might have been disturbing to non-academic readers, but he wrote with verve, flashing insights, arresting ideas and lucid prose. As he set out in one of his most popular books, The Age of Revolution, the economy — or the mode of production — determined everything else. In this manner, he brought a Marxist interpretation to a wide readership”. Hobsbawm’s embrace of the already Stalinist British Communist Party is a complex issue. One however Evans is not really up to the task solving. It is pretty clear that Evans has no real understanding of the complex political issues that led to the CP’s break with Marxism and has only a cursory understanding of the Russian Revolution and its betrayal by Stalinism. This is not helped by Evans own hostility towards Trotskyism. Hobsbawm cites many reasons for his joining the CP. He had a lonely childhood and was always on the move. The CP became to some extent a substitute family who gave him security and friendship. However, more importantly, Hobsbawm was attached to its politics. Hobsbawm was always on the right wing of the party, and that took some doing. He shared with the Stalinist British Communist Party two significant things, one was a deep hostility to Trotskyism, and secondly, he was incredibly dismissive of the revolutionary capacity of the working class. Hobsbawm would retain these two interrelated perspectives to his dying days. Evans plays down MI5’s close attention to the CP and the Communist Party historians in particular. Hobsbawm and large numbers of CP members, their wives, husbands and friends were spied on. Spending a few days at the National Archives at Kew it is clear that this was not only a considerable operation but was conducted by leading members of MI5 and was orchestrated by leading members of the British ruling elite. The files themselves need a substantial book-length investigation. 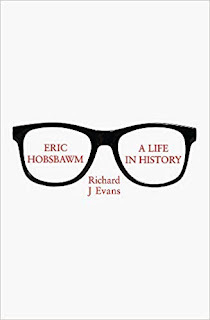 Evans believes that Hobsbawm despite being under constant surveillance had help from a social circle of friends that not only were members of the British secret service but were sympathetic if not actual members of the CP. How else would Hobsbawm get a US visa at a time when Communists were barred from the country. It was during the 1940s that Hobsbawm came to the attention of MI5, the domestic intelligence service. Among others being watched was a large number of historians involved in the Communist Party Historians groups such as the likes of AL Morton, Christopher Hill, Rodney Hilton and E.P Thompson. According to the Guardian “The files show that Hobsbawm, who became one of Britain’s most respected historians and was made a Companion of Honour while Tony Blair was prime minister, first came to the notice of MI5 in 1942 when he and 38 colleagues were described as being “obvious members of the CPGB [the Communist Party of Great Britain] on Merseyside”. He became number 211,764 on MI5’s index of personal files. Although he was cleared of “suspicion of engaging in subversive activities or propaganda in the army”, MI5 noted it was doubtful that he would be suitable for the Intelligence Corps. Roger Hollis, later head of MI5, and Valentine Vivian, the deputy chief of MI6, prevented him from joining the Foreign Office’s political intelligence department”. The origins of the CPHG are many fold and complex. The group included Christopher Hill, Rodney Hilton, Victor Kiernan, George Rudé, Raphael Samuel, John Saville, and Dorothy and EP Thompson. It would be true to say that the lives of these historians “mirrored the great events of the twentieth century”. Many of the historians who later became internationally recognised historians in their own right were first inspired by the book A Peoples History of Britain by A. L Morton to form a group that would examine “history from Below” or “peoples history” as it was commonly known. Another intellectual inspiration came from the historian R H Tawney and his “Social History” school. Later on, the group would be heavily influenced by the French Annales school. The collaboration between the CP historians and the Annales school would produce the groundbreaking journal Past and Present. The journal attracted distinguished scholars such as Moses Finley, Lawrence Stone and John Elliott who joined CP members Hill, Hilton, Thompson. Hobsbawm, of course, was part of this extraordinary group of historians. The Communist Party Historians Group took on many of the characteristics of a political party. It had membership subscriptions, a secretary and a chairman. It was not a homogenous group, and most of the historians were radicalised in the 1930s by the rise of Fascism and the oncoming Second World War. Having researched this period In Hobsbawm's life and having unrestricted access to his files Evans comes up with the preposterous statement that he did not think Hobsbawm was a Stalinist. What is more unbelievable is that Hobsbawm himself did not believe he was a Stalinist. Saying he “was not a Stalinist. I criticised Stalin, and I cannot conceive how what I have written can be regarded as a defence of Stalin. However, as someone who was a loyal Party member for two decades before 1956 and therefore silent about many things about which it is reasonable not to be silent - things I knew or suspected in the USSR. Why I stayed [in the Communist Party] is not a political question about communism, it is a one-off biographical question. It was not out of idealisation of the October Revolution. I am not an idealiser. One should not delude oneself about the people or things one cares most about in one's life. Communism is one of these things, and I have done my best not to delude myself about it even though I was loyal to it and its memory. The phenomenon of communism and the passion it aroused is specific to the twentieth century. It was a combination of the great hopes which were brought with progress and the belief in human improvement during the nineteenth century along with the discovery that the bourgeois society in which we live (however great and successful) did not work and at certain stages looked as though it was on the verge of collapse. Moreover, it did collapse and generated awful nightmares “. From an international standpoint, the CPHG was probably the most important collection of historians ever to write and study on a variety of subjects. For the subject of the English revolution, it produced one of its foremost historians Christopher Hill. It would be fair to say that these historians books have shaped the world-historical view of a generation of students, academics, and lay people. However, the historians would pay a heavy price for their membership of the CP As Ann Talbot explains “In more recent areas of history, as in politics, the control of the Stalinist bureaucracy was too high to allow the free development of Marxist thought and whether deliberately or not they all avoided venturing into the modern arena. “It is notable that of the Marxist Historians Group Hill wrote on the seventeenth century, Thompson on the eighteenth century, Hobsbawm mostly on the nineteenth century and Hilton on the Middle Ages. However, none of them specialised in the twentieth century. In more recent areas of history, as in politics, the control of the Stalinist bureaucracy was too great to allow the free development of Marxist thought and whether deliberately or not they all avoided venturing into the modern arena. It is notable that E.H. Carr, who was never a member of the Communist Party but wrote on the history of the Russian Revolution and expressed high regard for Trotsky, was for long periods unemployed and unemployable because his views clashed with those on both the left and right of British academic life”. Hobsbawm was acutely aware that broaching the subject of the 20th century and especially the Russian Revolution was largely taboo. According to Hobsbawm “it raised some notoriously tricky problems”. A simple study of the journal Our History between 1956 and 1992 showed there was not a single article dealing with any part of Soviet history would confirm this. Hobsbawm was one of the few CP historians to write in the 20th century and the taboo subject of the Russian revolution. However, this was done mainly after the group had collapsed. When Hill wrote his book Lenin and the Russian Revolution, it was attacked by John Gollan for not being sufficiently hostile towards Leon Trotsky, Gollan wrote “Because of this completely insufficient attention was paid to the history of the Communist Party and the struggle around policy in the period immediately before and during Lenin’s illness and death. Hence the role of Stalin as Lenin’s successor, his struggle against Trotskyism are not brought out. In his references to Trotsky, Comrade Hill correctly presents Lenin’s criticism of Trotsky’s role at decisive periods of the revolution. However, Lenin did not and could not know that Trotsky and his confederates, already in those days were wreckers and plotters criminally associated with foreign powers. Stalin succeeded to Lenin’s leadership, not only because of his mastery of Lenin’s teachings, but because of his record in the pre-revolutionary days, his editorship of Pravda, his work on the national question, his leadership in the insurrection, the decisive role entrusted to him by Lenin in the Civil War, and above all, his leadership of the Party in the critical tense period of Lenin’s illness and death. If this had been done Trotsky’s “History” could never have been included in the bibliography”. Several reviews of Evans book have touched upon Hobsbawm’s scepticism towards achieving Socialism. One writer puts it “Whenever he speaks about socialism, Professor Hobsbawm is plunged into the deepest pessimism. However, when he speaks of the prospects for capitalism, he immediately perks up and expresses his complete confidence in its prospects”. It is clear from the early days of his membership in the CP Hobsbawm never really believed that the working class could overthrow capitalism in a revolutionary way. At best it could hope for is to ameliorate the worst aspects of capitalism and put its faith in a reformist labour government. This last quote is one of the reasons that it is problematical to label Hobsbawm a Marxist. Hobsbawm is very cynical when criticises the “the antiquated beliefs of the Left”. These beliefs are nothing more than a defence of Classical Marxism. A form of Marxism Hobsbawm abandoned when he entered the CP. This hostility towards the “the antiquated beliefs of the Left” was expressed in its sharpest expression in Hobsbawm’s attitude towards the Russian revolution. An attitude supported by Evans in his book. Hobsbawm’s viewpoint on the Russian revolution is that it was “doomed to failure” and a “fatal enterprise”. Hobsbawm’s pessimism was picked up by the conservative Economist magazine which gloated in its obituary of Hobsbawm “Communism collapsed ‘so completely ‘that it must now be apparent that failure was built into this enterprise from the start”. According to the Marxist writer David North ”the subject of the Russian Revolution is dangerous territory for Professor Hobsbawm, for in this field his scholarship is compromised by his politics. Hobsbawm once confessed that as a member of the CPGB he had avoided writing about the Russian Revolution and the 20th century because the political line of his party would have prevented him from being entirely truthful. Why he chose to remain a member of a party that would have compelled him to tell lies is a question to which he has never given a convincing answer. At any rate, it would have been best for him and no loss to the writing of history, had he continued to limit himself to events before 1900”? Throughout his entire career, Hobsbawm defended the worse aspects of Stalinism. Of the Nazi-Soviet Pact of 1939, he thought that Stalin made “a wise move”. Even more sickeningly he said it was “surely not easy” for Feliks Dzierżyński (founder of the Soviet secret police) to have people shot, an “objective cruelty” that was justified by “belief in the proletariat and the future of the movement”. Hobsbawm defended his Stalinism in this reply to, Assistant Secretary of the Communist Party, George Matthews; he wrote: “We have presented the facts wrong or failed to face them, and unfortunately, though we have kidded few other people, we have kidded ourselves. I do not mean primarily the facts revealed at the Twentieth Congress and others of the kind. Many of us had strong suspicions about them, amounting to a moral certainty, for years before Khrushchev spoke, and I am amazed Comrade Matthews had none. There were overwhelming reasons at the time for keeping quiet, and we were right in doing so. No, the facts we failed to face are those about Britain, our tasks and our mistakes”. It comes as no surprise that Hobsbawm defended the Moscow Trials. The trials saw the frame up and murder of not only all the leading members of the Bolshevik party but hundreds of thousands of workers who took part and defended the October revolution. The repercussions of the trials were felt all over the world as Fred Williams wrote “the Moscow Trials and the blood purges that followed had a devastating impact, virtually annihilating the socialist elements in the working class and intelligentsia. The trials paved the way for the betrayals and defeats that followed—the suppression of the French general strike, the defeat of the Spanish Revolution, the Stalin-Hitler pact, the suppression of the postwar revolutionary upsurge—all of which culminated in Stalinism’s final betrayal, the dissolution of the Soviet Union in 1991 and the restoration of capitalism”. It hardly comes as no further surprise that Evans and Hobsbawm relegate Leon Trotsky and Trotskyism to a minor historical role in both their books. Terry Eagleton points out, Hobsbawm and Evans for that matter consign “one of the most fertile currents of modern Marxism – Trotskyism – to a few casual asides”. When Hobsbawm decided to write on the Labour Party or Labour history he had already drawn very pessimistic conclusions from the post-war defeats suffered by the working class which his party along with the trade union leadership and the Labour Party had organised. Hobsbawm had very close political ties to the Labour Party and was even made– a Companion of Honour by a Labour government. A rarity for a historian especially of his political persuasion. Hobsbawm was lauded from both sides of bourgeois democracy in Britain. Labour leader Ed Miliband said Prof Hobsbawm was "an extraordinary historian, a man passionate about his politics and a great friend of his family”. His historical works brought hundreds of years of British history to hundreds of thousands of people. He brought history out of the ivory tower and into people's lives. However, he was not simply academic; he cared deeply about the political direction of the country. Indeed, he was one of the first people to recognise the challenges to Labour in the late 1970s and 1980s from the changing nature of our society." In this respect, Milliband says more than he intended. Hobsbawm was a principal theoretical architect of the right wing shift of New Labour. During his membership of the "Eurocommunist" wing of the CPGB and his time with the Marxism Today’s theoretical journal, he wrote many articles urging labour to adopt a more right-wing trajectory. In 1978 he wrote the essay “The Forward March of Labour Halted”. Which in many ways laid the basis for Labours future development? "If anything, I was an extremely right-wing Communist and generally attacked by the leftists, including the leftists in the Labour Party". Hobsbawm's relationship with the origins of New Labour was explored in an article by Chris Marsden which revealed Stalinism’s role in spawning new Labour. Marsden said the Communist Party of Great Britain Euro-Communist tendency acted as the midwife of New Labour. Marsden writes that the “ideological framework for what was to become New Labour was first established in the editorial offices of Marxism Today. Moreover, it was mostly made possible to implement the project so defined due above all to the liquidation of the Soviet Union”. Hobsbawm had no real faith in the revolutionary capacity of the working class as can be seen in his Marx Memorial Lecture in 1978 The Forward March of Labour Halted. Marsden says “Hobsbawm too began by asserting that the crisis of the labour movement could be attributed to the decline of the working class itself. His evidence for this mainly consisted of a presentation of the fall in the number of workers employed in heavy industry and the supposedly concomitant fall in support for the Labour and Communist parties. He then argued that industrial militancy had failed to provide an answer to the failures of the Labour government of the time. Hobsbawm’s lecture was not just unconvincing. It was an attempt to provide an apologia for the betrayal of the working class by Labour and the TUC. He was writing after the election of a Labour government in 1974 as a result of a mass militant movement that culminated in the downfall of the previous Conservative government of Edward Heath. After making sure minimal concessions to the miners, who had led that campaign, Labour had proceeded to implement austerity measures demanded by the International Monetary Fund and, when this produced a significant decline in its support amongst workers, had formed a coalition with the Liberal Party in order to continue with its attacks. Hobsbawm responded to this by blaming the working class—and identifying a supposed decline in its numerical strength—for Labour’s loss of support”. Despite Hobsbawm’s fawning support of Labourism some of his work on Labour history is still worth reading, and much of it was groundbreaking. As historian Norah Carlin put it “his studies of early nineteenth-century machine-breaking, Primitive Methodism, and general unions in Britain, for example, broke new ground and inspired a generation of Marxist labour historians”. In examining the history of the British Labour movement, Hobsbawm discounted the possibility of a Marxist Party being established in the working class or as Norah Carlin puts it “Hobsbawm became so convinced that the dead weight of tradition on the British labour movement was irremovable?.In rejecting the ‘heroic moral epic’ style of labour history and deciding to concentrate on the long-term social and economic background of the movement, Hobsbawm ruled all revolutionary and near-revolutionary situations out of consideration. Thus he has very little to say about the high points of working-class struggle such as Chartism, the peak of the new unions in 1889-93, the waves of militancy of 1910-14 and 1919, or the General Strike of 1926”. There is no denying that Hobsbawm was an exceptionally gifted historian. He had an aptitude for writing in an accessible manner while retaining a robust academic rigour. If he had concentrated on writing about any other century than the 20th century, then this article would have taken a different course. However, he did not and much of his work written in the 20th century was influenced by his membership of the Stalinist British Communist Party. Hobsbawm core body of work was the Tetralogy. Hobsbawm understood in embarking on such a wide-ranging study that he was writing separate books but was, in essence, writing a history of the 19th century. Hobsbawm’s first book of the Tetralogy The Age of Revolution 1789-1848 while maintaining a very high academic standard was written for a broad audience. There followed The Age of Capital, 1848–1875 (1975), The Age of Empire, 1875–1914 (1987), and finally The Age of Extremes: the Short Twentieth Century, 1914–1991 (1994). As one writer puts it “Hobsbawm gained a global reputation after his first bestseller, The Age of Revolution was published by George Weidenfeld in 1962. In it, he jettisoned the customary political narrative. Instead, he provided a thematic, analytical account of the politics, economy, society, culture, the arts and sciences of Europe. In truth, the book’s perspective was mostly Franco-British, for its two ruling themes were the global impact of the French political revolution of 1789 and Britain’s contemporaneous industrial revolution. Hobsbawm gained a global reputation after his first bestseller, The Age of Revolution, was published by George Weidenfeld in 1962. In it, he jettisoned the customary political narrative. Instead, he provided a thematic, analytical account of the politics, economy, society, culture, the arts and sciences of Europe. In truth, the book’s perspective was mostly Franco-British, for its two ruling themes were the global impact of the French political revolution of 1789 and Britain’s contemporaneous industrial revolution. However, Hobsbawm projected European ideas into global history with a brio that seemed new and bracing. The book has never gone out of print and has been translated into 18 languages, including Arabic, Farsi, Hebrew and Japanese. Hobsbawm was not an orthodox Marxist, but he was a great historian. This contradiction would be the theme for a great PhD thesis. Politically speaking Hobsbawm was closer to social democracy and the conservative side of the Labour Party than to Marxism. The harsh tone of this article should not take anything away from Hobsbawm’s historical writing especially pre the 20th century, but you cannot separate his historical writing from his politics. You can take the man out of Stalinism, but you can't take Stalinism out of the man. Hobsbawm ended his days as a Liberal Democrat the logical political outcome of his earlier Stalinism. The Hobsbawm’s had a house in Hampstead and maintained a holiday cottage in the Brecon and Radnor constituency where he voted for the Lib Dems. He also died a very wealthy man, a Companion of Honour and a member of private members club Athenaeum and a small shareholder in Shell. Not the epitath most Marxists would want. 1. Hobsbawm, Eric J. Nations and Nationalism since 1780. Cambridge: Cambridge University Press, 1990. 5. Leon Trotsky and the Fate of Socialism in the 20th Century A Reply to Professor Eric Hobsbawm By David North 3 January 1998. 8. Professor Eric Hobsbawm Interview Transcript London, 17 June 2008 Interview was conducted for the project ‘Making history: the discipline in perspective’. 9. Interview with Maya Jaggi published in The Guardian newspaper in 2002.